On one of my web server, after installing an SSL certificate, I thought of hardening the web security by implementing SSL/TLS Deployment Best Practices. The server has both IIS and SQL Server running on it. 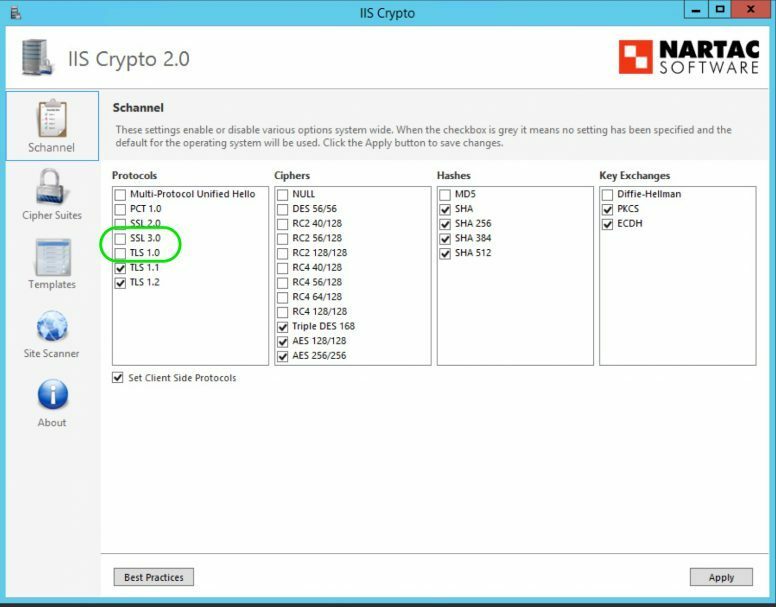 Based on the findings from the SSL Server Test tool, I have used the IIS Crypto software to disable the SSL 3.0 and TLS 1.0 protocols. After disabling the protocols and restarting the server, my website stopped working. On analyzing the website log entries and events, I figured out that the SQL Server service was not starting, I learned in a hard way that disabling TLS 1.0 And SSL 3.0 affects SQL Server 2014. Lets go to the issue in detail. My web server is Windows Server 2012 R2 and has SQL Server 2014. I have used IIS Crypto software to disable the SSL 3.0 and TLS 1.0 protocols. After restarting the server the website was not working. The web site log has entries related to unable to connect the SQL Server. On trying to login to the SQL server using SQL Server Management Studio (SSMS), I got an error message saying that the server is not available. So, I checked the SQL Server Service and found that it is not yet started. I manually tried starting the server with no success. Finally, on checking the event logs, I found a series or error messages. Some of the errors are given below. The server was unable to initialize encryption because of a problem with a security library. TDSSNIClient initialization failed with error 0x139f, status code 0x80. Reason: Unable to initialize SSL support. The group or resource is not in the correct state to perform the requested operation. Could not start the network library because of an internal error in the network library. SQL Server could not spawn FRunCommunicationsManager thread. information about possible related problems. As a temporary solution, I quickly enabled SSL 3.0 and TLS 1.0 protocols and restarted the server to bring back the website up and running. Then on looking for a permanent solution, I have identified tree solutions. I have listed the solutions below so as it will be helpful for someone. The best solution is to segregate the SQL Server from IIS server. Segregating SQL Server from IIS Server is a best practice for security and performance of the website. However, it is not be always possible to have a separate server for MS SQL. Budget constraints may force you to have a single server with both SQL Server and IIS. In such a scenario, you can try the below solutions. Based on your SQL Server and service package version, you have to select and install the SQL Server Cumulative Update from this list under the heading how to know whether you need this update. Then you have to choose the client component downloads based on your environment whether you are using SQL Server Native Client or ADO.NET SqlClient. Finally install .NET Framework 4.6. This is to make the SSMS, SSRS and report manager to connect with SQL Server Engine. Hope this will help you to secure your web server with TLS 1.2. Web.config settings to redirect HTTP url to HTTPS url.